In newspaper parlance, a beat is the subject area that a reporter is assigned to cover. Beat reporters can cover everything from local crime to a specific sports team. They develop expertise in their beat area—getting to know the right people, cultivating contacts, and earning the trust of those who have the information they need. For example, if you're a beat reporter covering baseball, you need access to the manager (and perhaps general manager) of the local (or major league) baseball team. Over time, this kind of journalist can report on baseball with authority and a depth of understanding. Typically beat reporters work with a specific editor who also knows the beat and can guide the reporter toward sources or information as well as help shape stories. A reporter covering retail companies might report to the business editor, for instance, who will be able to help that reporter gather information more effectively. The Meaning of the Term "Beat"
The word "beat" is derived from police work. Police officers typically have an assigned route or neighborhood where they "beat a path" while patrolling the area. Hence, journalists beat a path in their assigned subject area. With the newspaper industry struggling to remain profitable and relevant as online competitors continue to change the business model of journalism, developing a niche or a beat is more important than ever. Multiple news outlets cover the "what" of the news, but good beat reporters can also provide the context of "why" and "how." Beat reporters are expected to develop sources (i.e., people who have information about their subject matter), so that they can better gather news and find scoops. For example, sources for a reporter on a crime beat would be local cops. By talking to the local cops and developing a rapport with them, the beat reporter can more easily get the information needed about crimes happening in the neighborhood—including major stories on such happenings as large drug busts. However, to offer balanced coverage, a crime beat reporter needs to go beyond just developing sources like cops. They'll need to know defense attorneys, community leaders, coroners, judges, district attorneys, and public defenders. Good beat reporters are so immersed in their beat that they have people who contact them with news tips. This relationship all comes down to trust, which could take a beat reporter several years to cultivate. In this area of journalism, there no substitute for personal contact. At major national publications like the New York Times, there are dozens upon dozens of beat reporters. For example, the Times doesn't just have an education reporter, it has a K–12 reporter and a higher education reporter. A good beat reporter is familiar with the background about the area covered and knows the specific language of the area. 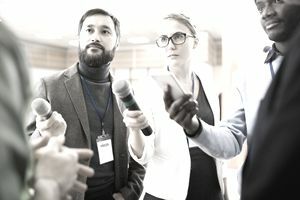 Beat reporters must also be skilled at asking the right questions (and if necessary persisting until they get the right answers) and be able to recognize newsworthy information. Because beat reporters write for general news outlets, they also must have the journalist ability to write understandable stories for readers unfamiliar with a topic. Beyond their ability to write well, these kinds of reporters need to be able to thoroughly research a story in order to give a complete account and know who supports an issue and who is against it. Although the digital landscape has put a major crimp in the traditional print industry, major newspapers like the Wall Street Journal and the New York Times remain healthy. More importantly, people will always have a need for their hometown paper for news about local politics, sports, food, entertainment, and so on. In essence, the role of the beat reporter hasn't changed; there are just fewer of them as print media cuts back. Public relations professionals have always nurtured relationships with the media in a symbiotic way. Organizations and businesses—from Fortune 500 companies to nonprofits like the Girl Scouts of the U.S.A.—have PR representatives whose job is to secure positive news coverage for their operation. Conversely, these PR practitioners are also tasked with handling queries they receive from reporters requesting information about stories they're doing that involves the company. To be effective, beat reporters need to develop solid relationships with PR professionals, who are the gatekeepers responsible for disseminating information.